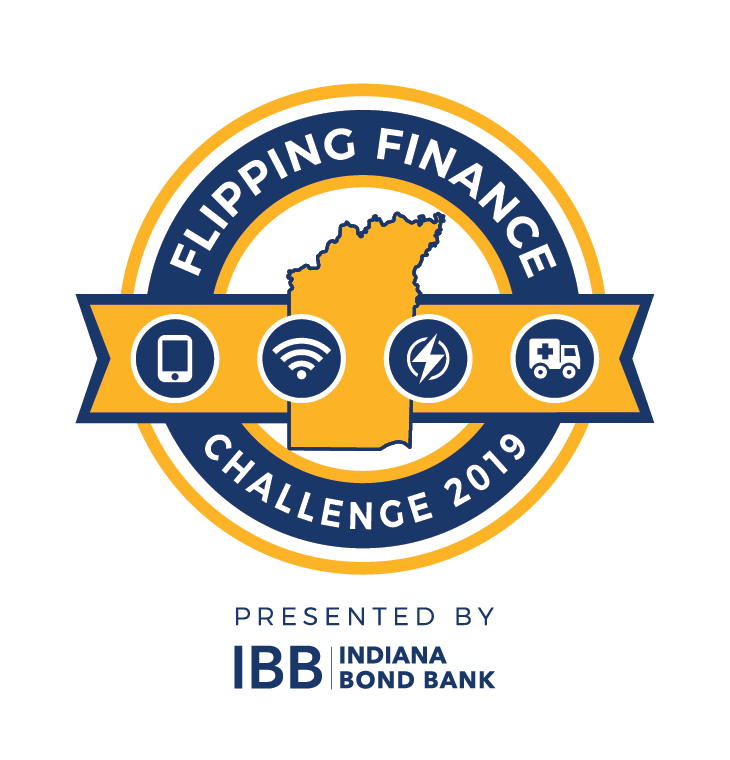 Indiana Bond Bank’s first ever Flipping Finance Challenge, a public-finance focused innovation summit. Click here for the full attendee guide! In order to be successful in developing a solution to one of the challenges below, attendees are strongly encouraged to choose a specific challenge within the tracks below well ahead of the 18 hour design-sprint and use the resources provided to obtain as much background and research information as possible. Like many rural areas, this region faces challenges of obtaining of access to broadband and high-speed internet services. Currently, the lack of broadband in the area affects the Region’s ability to attract new industries and the accompanying workforce talent. It also tends to limit the ability of school children to participate in E-Learning days when school is closed due to inclement weather, as well as current residents to remain in the region while attending online college. The Region is challenged with creating the processes necessary to implement a Broadband Ready Community certification by the Indiana Economic Development Corporation in a format that is identical or nearly so across the entire Region. The Region would like to assess current alternative fuel transportation opportunities, as well as needs in the next 10-20 years. The Region would like to become a rural hub for smart and alternative fuel transportation in the area. The Region currently hosts the only two electric car charging stations between Indianapolis and Cincinnati, an amenity/necessity which has made it a stopping point for travelers with e-vehicles. Should charging stations be expanded? Are there other alternative fuel opportunities that should be explored? Compressed Natural Gas for example? Like any community in the United States, the Region understands that for it to attract new businesses and residents to the area, it must be flexible and agile to the needs of the technology industry. The Region is challenged with (especially as rural communities) becoming agile enough to make it an attractive destination for tech related companies. The Region is interested in ideas tapping into the Internet of Things. The Region is interested in ideas which build upon the electric vehicle charging platform referenced in Challenge #6. Like any community in the United States, the City of Gary understands that for it to attract new businesses and residents to the area, it must be flexible and agile to the needs of the technology industry. Gary has several resources that would make it an attractive destination as a national transportation hub including potential for water, rail, and air transportation. Positioning Gary as a pilot center for driverless trucks, cars, various vehicles. Incorporating technology such as sensor-connected lights in buildings, streetlights, traffic lights, etc. Level One: Health and safety needs of children met. Level Two: Environment supports children’s learning. Level Three: Planned curriculum guides child development and school readiness. Level Four: National accreditation (the highest indicator of quality) is achieved. The need for quality daycare is not an income driven problem and is experienced by all workers in the Region. Aside from obtaining a Level Four accreditation, because of the region’s diverse workforce, there is a need for 24/7 daycare and emphasis on components of education. City of Gary Challenge: How Might the City of Gary Manage, Maintain, and Preserve the Native Ecology of the area while growing? Relevant Resources: See main resource page. City of Gary has a study which shows that Gary residents have a higher incidence of preventable diseases, such as Type II diabetes and cardiovascular disease, than the national average. In addition, portions of Gary are considered a food desert. Gary sees these as factors which could detract from quality of place and quality of life for current and prospective residents. The City of Gary’s public, residential and business activity has gone through several changes in composition in relation to its geographical boundaries over the year. Gary’s geographical boundaries measure approximately 58 square miles with a population of approximately 76,000. Comparatively, Boston Massachusetts, has a geographical footprint of approximately 89 square miles but a population of approximately 685,000. This composition has resulted in areas of very low-density within the City of Gary limits that still require extensive government resources to maintain. For example, the Public Works Department has only 27 public-facing employees responsible for all the road miles of the streets. Identify ways that the City of Gary might repurpose active and inactive plots of land within the city limits while maintaining those boundaries as to not lose critical assessed value to the city. The City of Gary has an abundance of available housing stock that has the potential to meet the needs of certain demographic segments. The challenge is identifying which populations should be targeted and through what avenue. For example, would Chicago area retirees without children in the household be a better fit for the existing housing stock considering they do not have school age children (and thus do not have to consider Gary Public Schools? As the city seeks to grow its residency base by attracting new costumers to existing and potential housing stock, the city also maintains a priority that “Legacy Residents” not be displaced by new and incoming residents and rising prices in residential properties. Legacy Residents are considered to be those who were born and raised in the City of Gary. Richmond desires to create housing in the downtown quadrant (see map) which is ‘move-in ready’, as in, does not require more than cosmetic repairs. Many of the existing living opportunities in downtown Richmond require extensive rehab for livability and safety. One of several obstacles preventing ‘move-in ready’ development are buildings which have deteriorated after a time period of being vacant. While these buildings can be rehabilitated to prepare for move-in ready development, the worse the deterioration, the more time and money it takes. This project, as envisioned, would provide subsidized housing for 40 to 50 families while the head of household is attending post-secondary education in pursuit of a credential or degree leading to a good-paying job. The Townsend Scholar House component of the project would involve redevelopment of the historic Townsend Center into a community center capable of providing supportive services to the Townhomes residents that will help them be successful in their educational pursuits. With trail systems being a major attraction to many communities throughout Indiana, the Region would benefit in leveraging its unique 5-county partnership to create multi-county trails. Like many rural areas, the region is faced with the difficulty of competing with urban areas that seem to be the most attractive to funders. The Region is challenged with leveraging its robust trail mileage to obtain funding that will connect the trails throughout the region. The Region would like to determine whether it is financially feasible to create a Regional Development Authority within the EIRPC area in order to implement projects. 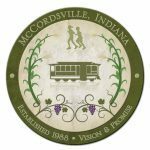 The Town of McCordsville is a small (approx. pop. 7,500), but very fast-growing community as the 3rd fastest growing municipality in the state. The growth of theTown, and of the surrounding area, has contributed to a significant traffic congestion problem. The pinch-point of this congestion is on Mt. Comfort Road at its adjacent intersections with SR 67 and the CSX railroad tracks. This portion of Mt. Comfort Rd. sees in excess of 13,000 vehicles a day. The intersection of Mt. Comfort & SR 67 pushes through in excess of 25,000 vehicles a day. Clearly the volume of traffic being produced is by more than just McCordsville. This is a regional traffic issue in which a solution outside of bond issuance is necessary. During the past year, Purdue University’s Center for Regional Development and Ball State University’s Indiana Communities Institute have both conducted assessments of the Region’s demographic and economic statistics that confirm our collective perceptions. For our Region to prosper, we must improve its Quality of Place to insure our ability to attract new residents and to keep our current citizens. A major piece to attracting residents to our region is the development of new housing stock. The Eastern Indiana Region currently boasts numerous attractions including restaurants, shopping, trails, destinations, parks, bodies of water, etc. The Region needs a digital, user-friendly, database driven tool to make these attractions visible, engaging, informative and easily accessible to both visitors and current residents. One challenge that would be specifically beneficial, is a region-wide application that maps out the area’s destinations and means to access them, along with enabling descriptive content, photos, possible video snippets, digital mapping and other trending digital tools to make the application engaging and interactive with the user. The City of Gary has identified opportunities to improve the capacity and processes in which its capital planning is carried out. Gary would like to make changes strategically rather than by necessity, such as when vehicles break down or IT systems become outdated. The following have been identified as strategic priorities regarding the improvement of the capital planning process. Capital planning for Implementation of new IT system and/or planning for lifecycle IT changes. The City of Gary has an extensive and rich history known both around Indiana and across the United States. The City acknowledges that along with the positive perceptions that accompany Gary, there are several negative perceptions that exist surrounding the city as well. The City of Gary has made it a priority to dispel any misstated facts and perceptions that exist, however, it is not uncommon to hear that the following perceptions still exist among both residents and non-residents. “Gary is corrupt. Gary is crime-ridden. Gary’s only economic offerings are in relation to the steel industry. Beyond merely wishing people felt differently about them, these negative perceptions have real-life consequences for City of Gary. Economic impacts include limited access to capital or higher costs of capital, reduced willingness of people to partner, and adverse political impacts legislatively. The City of Gary has a limited team of workers to carry out all general service responsibilities. Gary has found that the quality of the work product and the customer service offered is inconsistent, and highly dependent on the individual performing the job. Gary aspires to have all its general services employees deliver a high-quality, high-customer service, consistent customer experience. Residents have the same expectations for quality service regardless of the Gary employee who delivers the service. What is the Flipping Finance Challenge?